Buenos Aires’ regional airport sits at the heart of the city along the river, and the city has clearly outgrown it. As my flight from Mendoza taxis to the terminal I can see that all gates are occupied and planes are double-parked on the tarmac in a line three hundred yards out, where busses ferry passengers back and forth. My flight arrives late, buffeted by some of the strongest updrafts I’ve experienced in a lifetime of flying, but my remise driver is waiting patiently in baggage claim. We pass into the city on an elevated highway within eyesight of the trendy neighborhoods I walked a week earlier. On either side of the highway is a shantytown, a secret Buenos Aires that many foreign visitors may never see. These are not cardboard cartons, but crude brick-and-mortar buildings rising up as high as three stories. Pirated electricity runs through lines draped among them and on the highest floors residents sit in this warm, humid evening on cheap lawn chairs in “wifebeater” shirts at eye level, watching us pass. I have seen this many times in Mexico, but it is my first sighting in Argentina. My driver explains that these are second and third generation squatters whom successions of socialist governments have been reluctant to evict. It’s nearly 11PM by the time the remise turns off the Avenida 9 de Julio beyond the obelisk and begins winding through the side streets toward my B&B. We pass the graffiti walls and shuttered windows of the Montserrat neighborhood and cross Calle Chile into San Telmo. Block by block shops and cafés appear ablaze with light and young people walk the sidewalks or cluster in doorways to share talk and laughs and smokes. The Noster Bayes Hotel is a classic. Floors probably laid before my father’s birth lead from the lobby up steep, narrow stairs between tiled walls. The night clerk, indistinguishable from many I have just seen outside on the street, checks me in. Our conversation shifts quickly from my bad Spanish to English, hers well-spoken with an accent I can’t quite place. As we decide when to schedule my next day’s remise to the international airport she calculates the transit time out loud, “cinq, six, sept, huit…” “Vous etes francaise?” I ask. “Swiss,” she replies. I’m not surprised; I’ve met world citizens like her throughout my time in Argentina. She leads me up the stairs to my room as I trail behind boosting my large bag up one step at a time and feeling a bit like Marty Feldman in Young Frankenstein. “There is no lift,” she says out of some need to state the obvious. 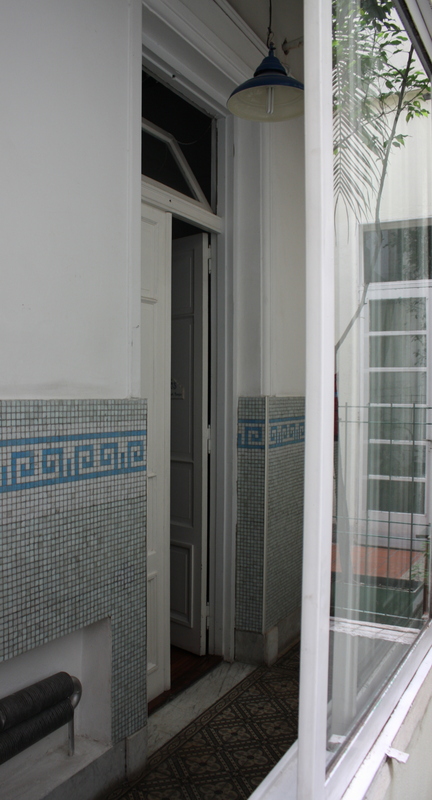 The staircase and hallway at the top look into an open-sky atrium, and below is a small patio predictably hidden from the street in the old Spanish style. High, narrow-paneled double doors lead offf the hall opposite the atrium, glass panels above them tilted open for air to circulate. She turns the heavy key in an old lock and opens one of the door panels. I wrestle the big bag through the narrow space as she fumbles for the light switch in the dark within. The air inside is still, hot and humid. “The air conditioning?” I ask. She flips a switch and the ceiling fan begins to spin. 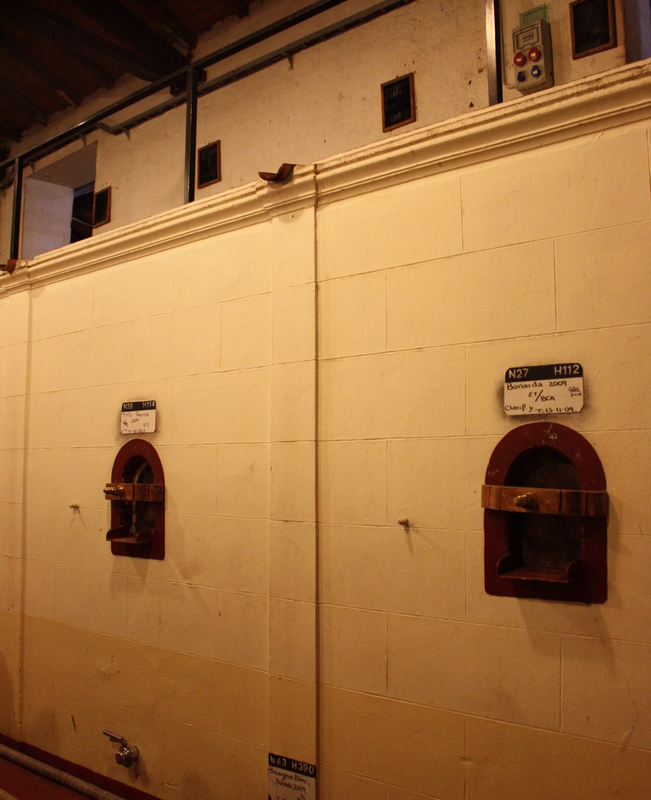 High on the wall above an air conditioning unit sits dark and mute. I turn to ask her about it, but she is already gone. It recalls a similar incident in Mendoza, and in both cases the lost-in-translation comedy works out well in the end . The room is not much wider than it is tall. The floor is finished wood plank and a giant armoire serves as a closet. The spartan furnishings are a combination of ultra-modern and kitsch. Each is themed fo a famous Argentinian and on this night I’ve drawn Buenos Aires Formula One race care driver Juan Manuel Fangio. It takes three tries to get the wi-fi connection to stick. “It is better on the lower floors,” the clerk tells me upon check-in, “but sometimes it goes out in bad weather.” I’m thinking that the storm I’ve just flown through should arrive here in a few hours. I check email and transcribe some handwritten notes made on the plane before preparing to turn in. I encounter my first Argentine bathroom without a bidet, but the old commode here has been ingeniously retrofitted with a chrome arm tucked inside of the bowl and attached to a lever outside that swings the arm and its small shower head into the center of the bowl. I wonder for the umpteenth time – but not for very long – what European women know that American women don’t… or vice-versa. Then I turn in. At 9AM on my last day in Argentina any expectation that the neighborhood will be sleeping off its late night partying is quickly disproved as I forego the B&B fare to walk the neighborhood in search of a café con leche and the perfect atmosphere in which to nurse it. 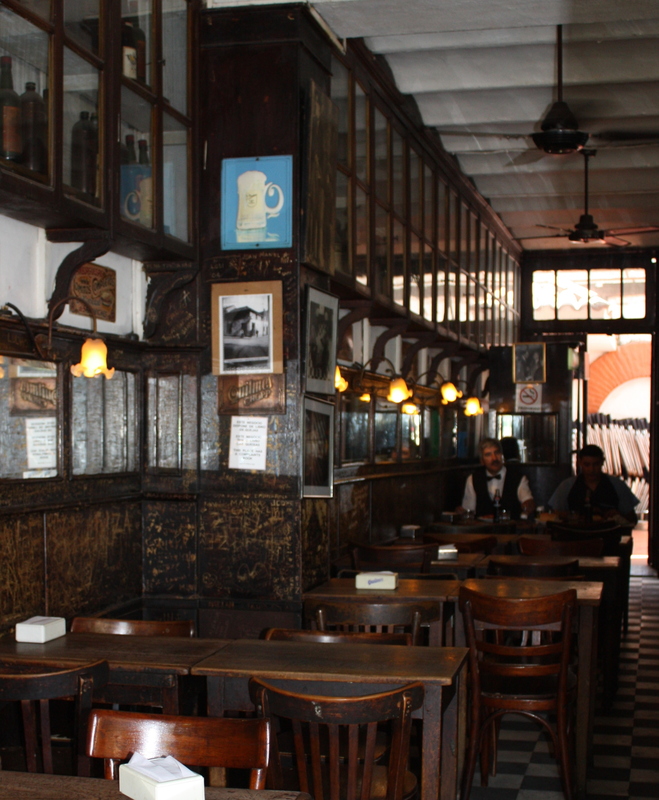 There is no lack of choice and I settle on the Café Roli, located at a busy neighborhood street corner on Calle Peru. I pick a windowside table where I can watch the comings and goings and settle in. Roli is another of the city’s endless classics. The place can’t possibly seat more than 50 or 60 people. Real wood tables and chairs are neatly arranged on a marble tile floor. At one end sits the requisite granite counter service bar covered with trays of fresh medialuna pastries. Behind it on mirror-backed shelves is a fully stocked bar. The patrons match the eclectic mix of the people on the street walking briskly to the Subte, catching one of the frequent standing-room-only busses or on rare occasion catching a taxi. There is a young couple in jeans, pullover shirts and tattoos looking much like those out on the streets only a few hours before. There is an obviously retired old gentleman engaged in a morning ritual of reading the newspaper front page to back. There are workers dressed for the office. The waiter looks remarkably like my Italian grandfather when he was still in his white-haired prime. He wears a crisply pressed, short sleeve shirt and a black pin-striped apron is tied at the waist. I can’t resist logging on to the wi-fi; no telling what I’ll find when I again attempt it back at the B&B. I spend what remains of my day walking the neighborhood bistros, bookstores, markets, and antique shops. The thing that strikes me most as I people-watch is that this is a vibrant organic community, home to a full spectrum of sub-cultures that co-exist in the same space from dawn to closing in a sort of time-share framed by centuries of architectural history. I’ve read that the true measure of a travel destination is its half-life: the number of days it takes for its luminescence to lose half of its radiance. Another measure of its power, I think, is whether or not we deem it worthy of a second visit. An accident of my itinerary has afforded me the opportunity to return for one day to my choice of the many B.A. neighborhoods visited a week earlier. 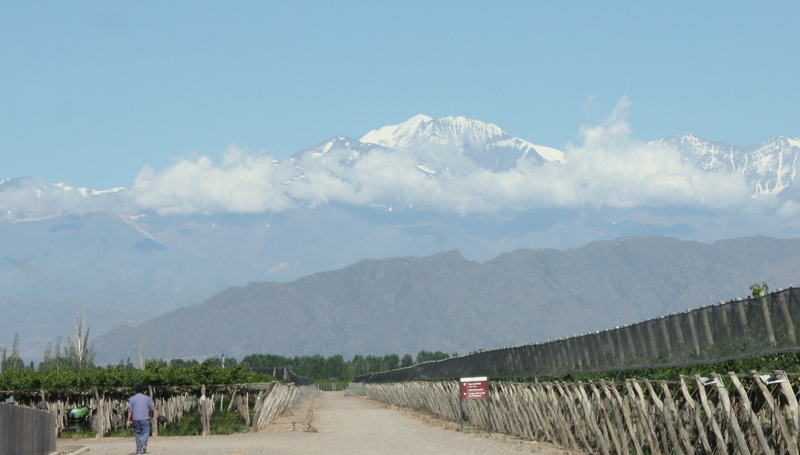 Mendoza may sit at the periphery of Argentine geography, but is also the subcontinental crossroads. As such it seems to look more to the west and to connect more closely to the region’s indigenous cultures than does Buenos Aires. The earthquake which in 1861 wiped Mendoza’s geographic slate almost cleans seems also to have freed it of many vestiges of Spanish colonialism. The ornate architecture that everywhere else marks the alliance of the Hapsburg monarchy and Jesuits is noticeably absent in the orderly geometry of its broad streets and public parks, and in the Latin contemporary lines of a more subdued skyline that conforms to the land rather than imposes upon it. 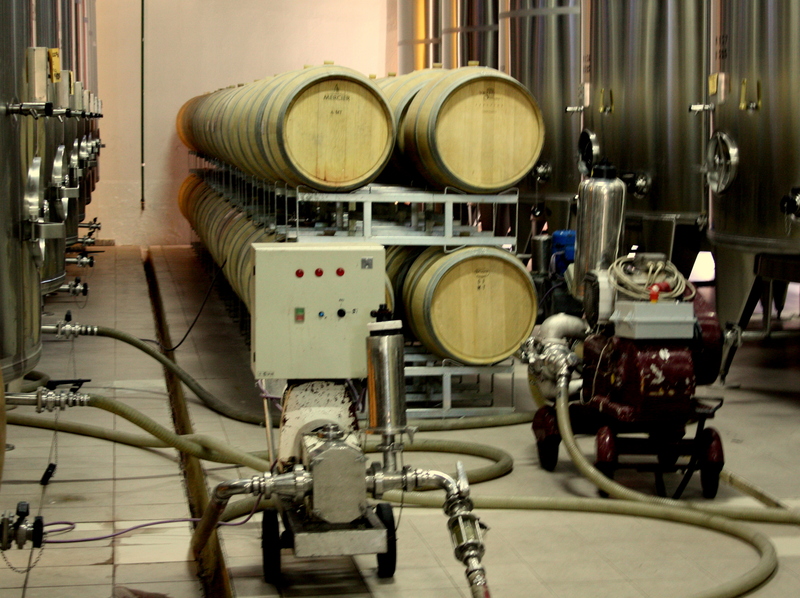 Few crops require a more highly tuned sensibility to the relationship between harvest and end product as the one between grapes and wine. That same sensibility seems to have translated into an aesthetic reflected in parks, monuments, performing arts, and dining that far exceed expectations of a city this size. 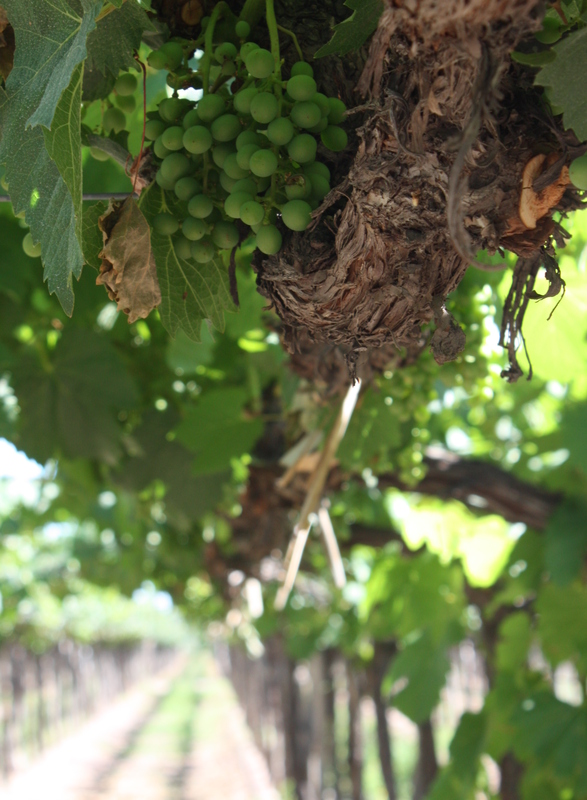 Andean earthquakes and avalanches, a propensity for harvest-threatening hailstorms, and the vineyards’ ever-present thirst for irrigation seem to have instilled in this place a clearer sense of man’s vulnerability to nature, and a longer view of its own economic rhythms. 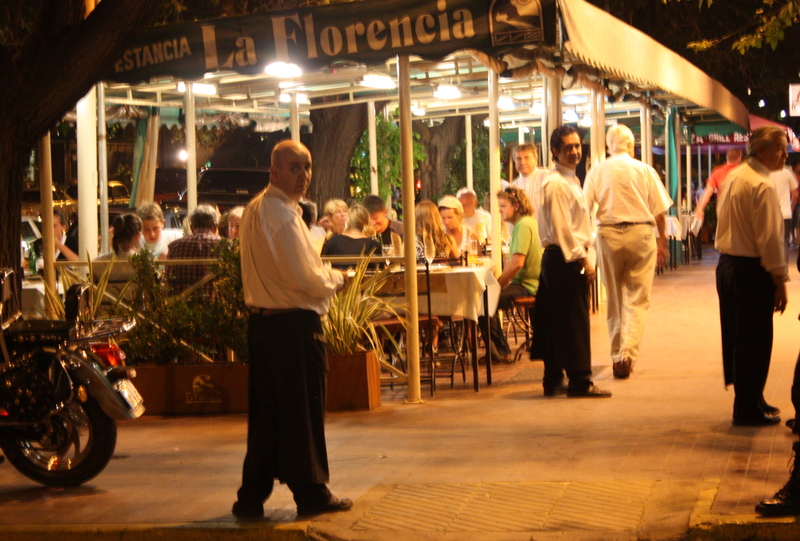 It is after sunset as I venture out onto Mendoza’s streets. Warm light spills over diners seated in stylish sidewalk cafes as aproned waiters ferry meals out to them. 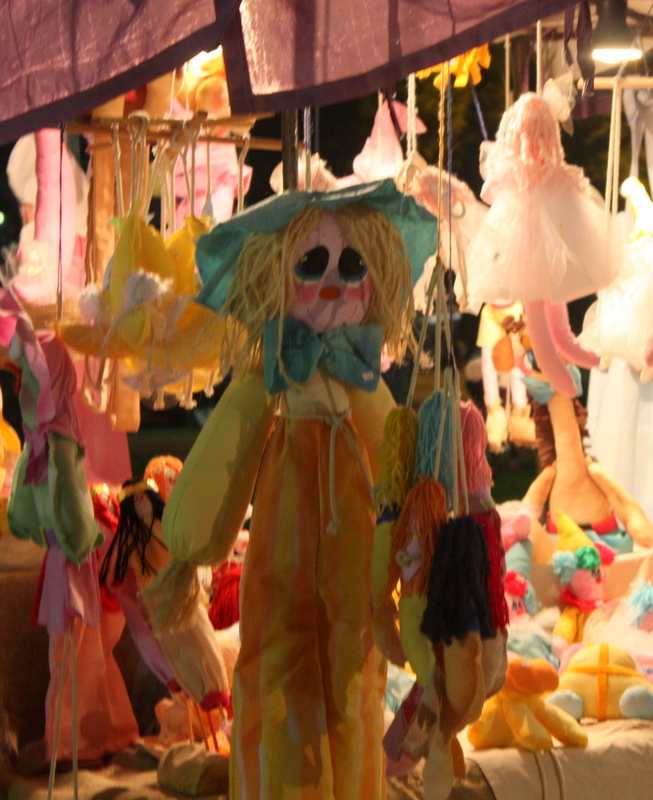 I wander down the block to the Plaza Independencia where a Christmas tableau stands outlined in colorful lights. Arrayed in a semicircle around the vast square are artisans at their booths, many working at their crafts as residents of all ages stroll among them. A young guitarist strums soulful American blues as the beat of Latin drums begins to pulse at the opposite end of the plaza. A Christmas theme headlines at the performing arts theater across the way, but American jazz appears prominently in its schedule of upcoming shows. Tonight I fly back to Buenos Aires, and it will be interesting to see how it will now feel in contrast to this place… and how this place will look as seen in B.A.’s rear-view mirror. As the wheels roll it’s about 100 miles from Mendoza to the Chilean border, but that’s only the short of it. 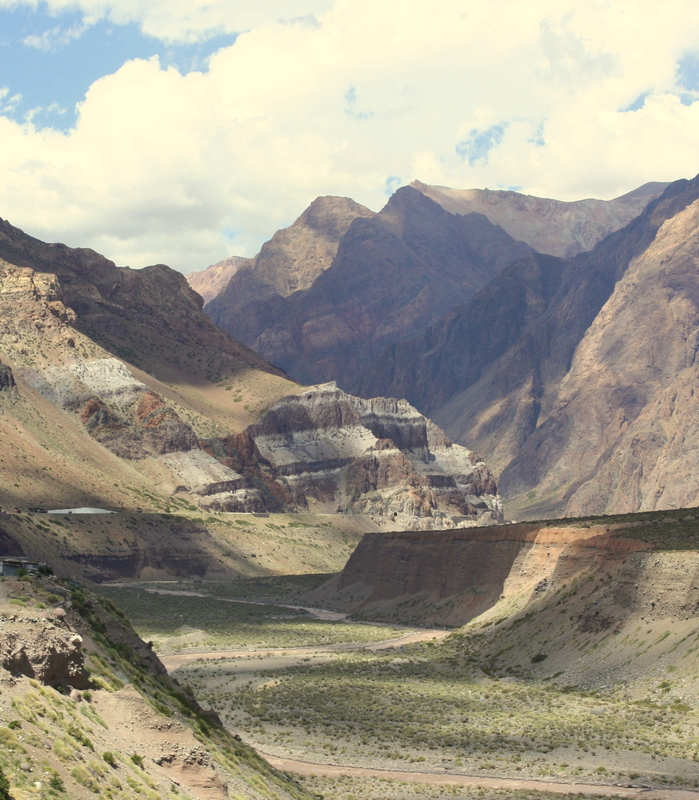 Most of the serpentine route winds upward into the Andes, sometimes for miles at a time behind a semi truck or tour bus, and on the way it passes through several micro-climates and a thousand or so years of human history. Even now in the heart of the Argentine summer there is snow on every peak in sight at the far end of the trip and a couple of the waystations resume their real lives as ski lodges every winter. 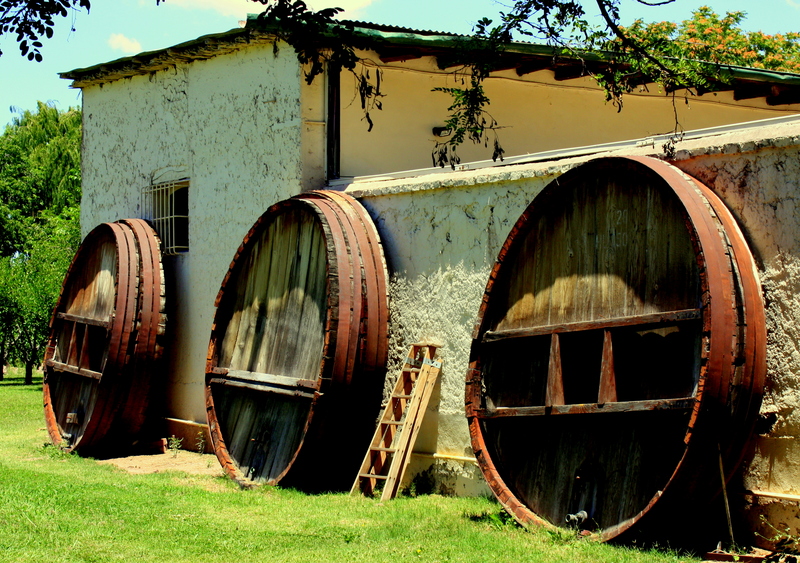 There you can stop for coffee and a hot meal, purchase bottles of Malbec or boxes of chocolates made in local villages along the route, or collect campy souvenirs. The trip starts out feeling like the westward drive from Northern California or the state of Washington; the first vineyards appear within twenty minutes or so. In fifteen minutes more, though, they give way abruptly to an arid landscape in which grows only sagebrush and wisps of desert grasses. Later in the trip lichens and button-sized flowers join this minimalist botanical garden and in a few small, fertile valleys oases of trees briefly appear, but these are not your Doug-fir-and-redwoods kind of mountains. Here the earth is laid open in great, tilted slabs. Sometimes it is stratified like slices of a giant layer cake and sometimes it lies congealed like icing dripped down its slides, but everywhere it is awe-inspiring in its grand scope. Here primeval, molten earth is set in stone as a palette of ochre and basalt and teal. Where aeons of erosion have dissolved it into flake and silt, the cracks and crags and crevices are filled in smooth with a rainbow array of watercolor streaks. Boulders ranging in size from refrigerator to boxcar litter the landscape, sometimes interrupted mid-slope in their rolling fall and elsewhere littered in mounds at the mountain’s base. A third or more of the way to the border a section of the old highway makes an off-road loop. 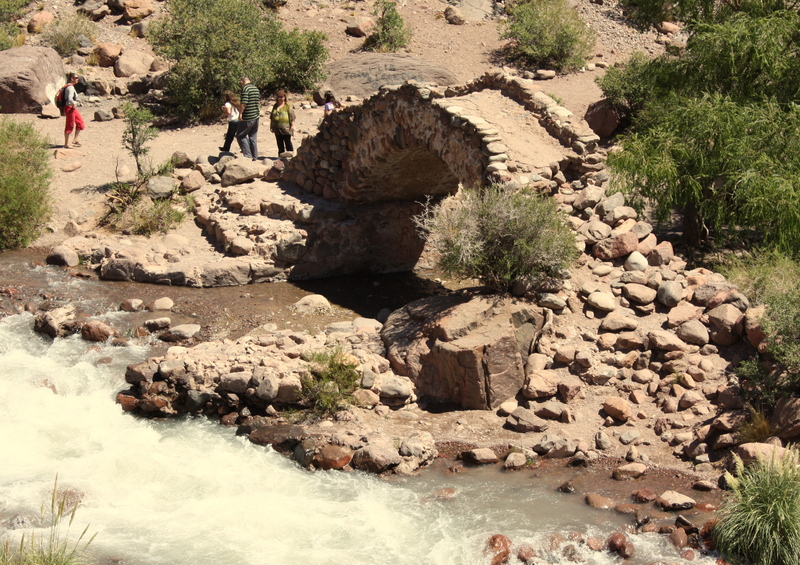 I follow it to the remnants of a stone bridge built across a tributary of the Rio Mendoza in 1817 by the army of General José de San Martin as his army, fresh from the liberation of Argentina from the Spanish, went on to liberate Chile and much of Peru. Two-thirds of the way I encounter along the roadside clustered sheds and lean-tos of a bazaar from which hang brightly colored blankets and clothing in native patterns. 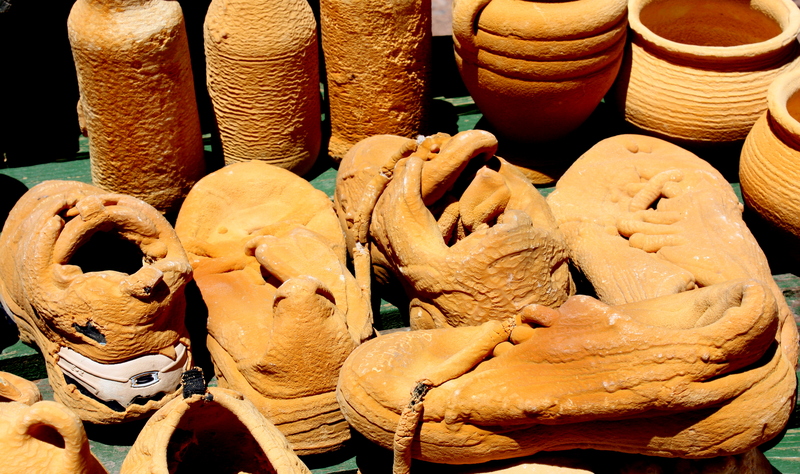 The work of artisans in leather and wood and silver and glass is displayed among them upon dozens of tables, but at the first I see everyday objects like running shoes that look as if they have been wetted and dipped in mustard-colored sand. Just beyond the tables and booths lies a giant crevasse split by a stream, and from a building perched on the opposite side giant, fantastic shapes in the same color seem to drip into the water below, streaked also with white and pink and gold. 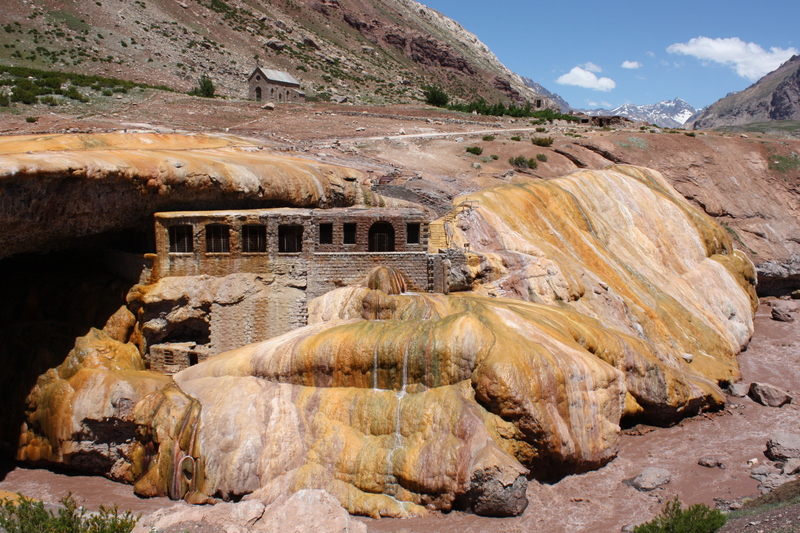 It is a hot spring, and the molten shapes are mineral deposits laid down over the centuries. The running shoe sculptures that first greeted me have been suspended in their water until covered by petrified mineral shells. This place was known to the Spaniards and long before them regularly visited by the Incas in their western-most travels. It is in fact called El Puente de los Incas: Inca Point. Ruins on the opposite side in the shadow of the mountain beyond are the remains of a modern spa crushed in 1971 by a landslide. A railroad once ran alongside the river back in the day when Butch and Sundance were robbing banks to the north in Bolivia, but now only its skeleton tracks and decaying bridges remain, crisscrossing the road carrying the busses and semis and cars that have replaced it. Fallen timbers and rockpile foundations of long-gone depots and coaling stations punctuate the tracks. In places the split ends of rails curve upward like coiled springs sprung. In others they lie draped like melted strands over gullies where wooden bridges have long ago decayed or their timber has been pilfered. 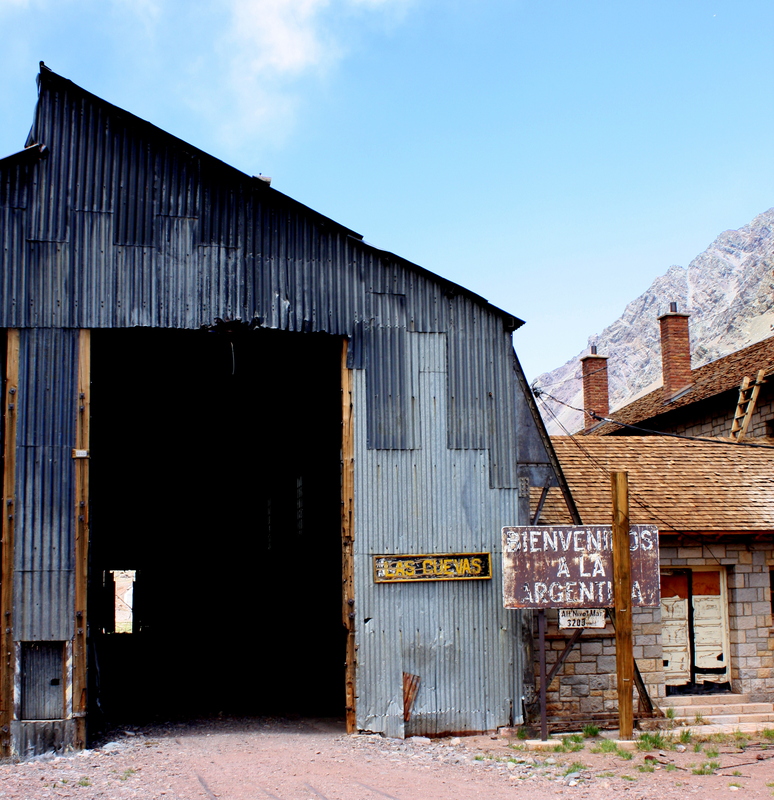 Decades of falling rock have in some places obliterated the railbed with piles of stone and in others made swiss chees of corrugated iron rock-fall shields as if in some giant shooting gallery. The new highway border station looks a lot like a toll-booth, and this is the place to turn around unless you’re going on to Santiago, Chile. Even as a non-stop drive the trip back feels long, but it’s a one-of-a-kind that can be experienced no other way. To come this far and miss it is to leave an important page missing in your catalogue of the Argentine experience. 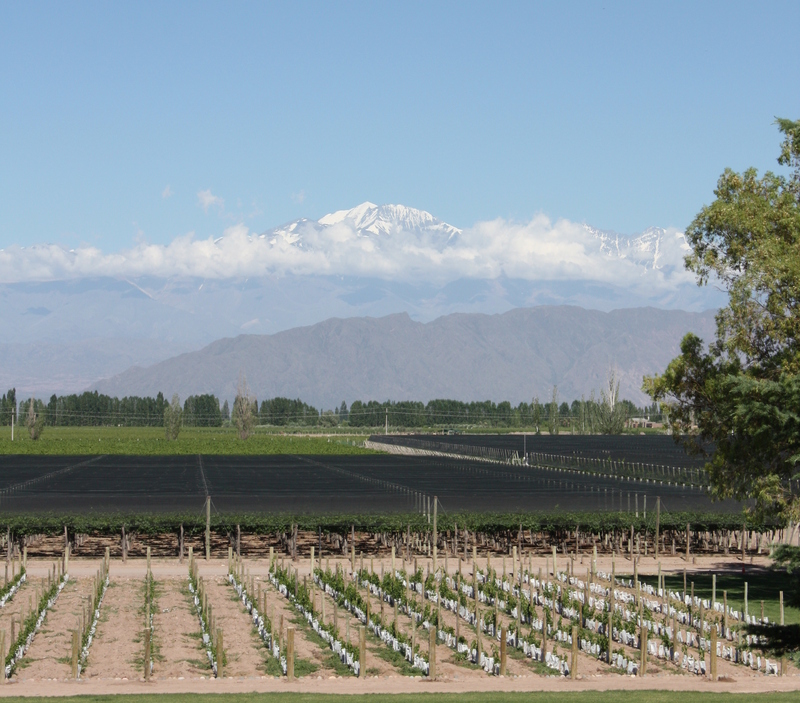 Like Denver, Mendoza is nested tightly against the east side of a spectacular mountain range whose foothills spill over to within a few miles. As in Denver, I notice for the first time mixed among the bus terminal throngs faces that are clearly indigeno – native American. On the way from the bus terminal to the hotel, my taxista tells me that 1.6 million people live here and I believe him, but the open skies of this sprawling low-rise city belie it. My hotel is situated along a broad main street and on this Saturday mid-afternoon I venture out between a nap and a city tour scheduled to follow before evening begins. Traffic on the avenida is light, and the next block down is occupied by hostels and restaurants and lined by late-model parked cars. Early Bird dinner specials may just be beginning back in the States, but here the Latin lunch is barely ended. In contrast to B.A., where restauranteurs drag a few extra tables onto the sidewalk when the weather’s good, it’s clear that sidewalk dining is a fixture here. Sidewalks separate restaurants from outdoor tables stacked three and four deep and covered by permanent-looking awnings with foul weather flaps neatly rolled up underneath. The main dining rooms are decorated in a casual brand of Old World elegance. 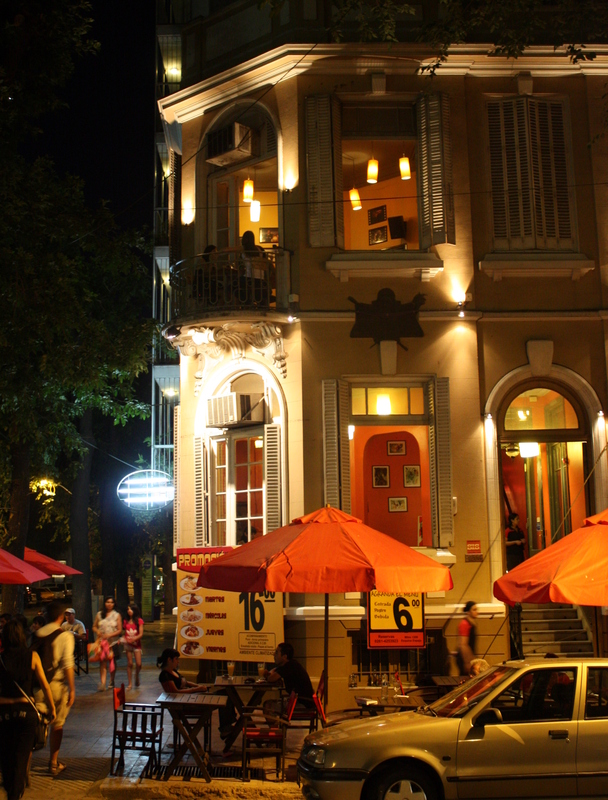 I lazily pick the one nearest to the hotel, where the menu runs a dozen pages and includes not only traditional Argentine dishes, but Continental specialties. And then there’s the wine list, which runs even longer. It’s ordered not by variety, but by local chateau, and I now know that I am in serious wine country. Parched from the long bus ride, I commit the ultimate blasphemy by first ordering a beer to quench my thirst. The waiter arrives with a bottle of the local Quilmes that I swear is 750 ml large and served in an iced bucket as if it was champagne… along with a pair of empanadas that has also somehow sneaked onto my order. I tell myself that I’m saving my appetite for dinner. The crowd here is both young and old and clearly far more casual and laid-back than even in mellow B.A. This place feels so much like Northern California that I wonder if some secret society of vintners stamps its cultural imprint on every place in which the grape is grown. Think Big Sur or Mendocino with a gaucho twist: Two tables down a striking,olive-skinned Latina in European designer glasses sits opposite a bearded guy in a plaid short-sleeved shirt , his baseball cap planted firmly over a bandana headdress. Los viejos – the older ones – wear polo shirts beneath their sports coats. If B.A. 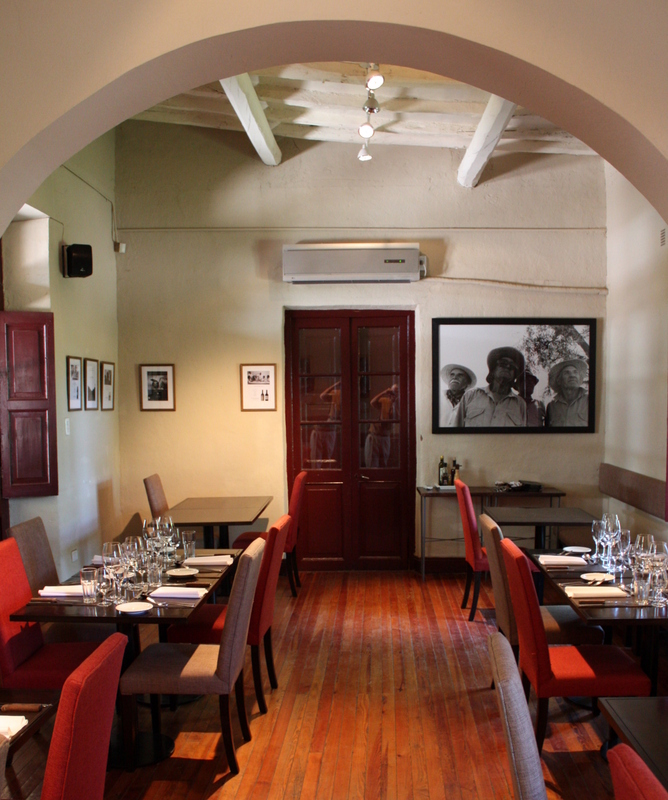 has wrung the pretension out of its European roots, then Mendoza has wrung from B.A. its essence, erasing the lines and leaving only the light and color as if in some Impressionist painting. The empanadas hit the spot. I apologize to my waiter for my poor Spanish, a tack which invariably earns both sympathy and magnanimity, before forging ahead. 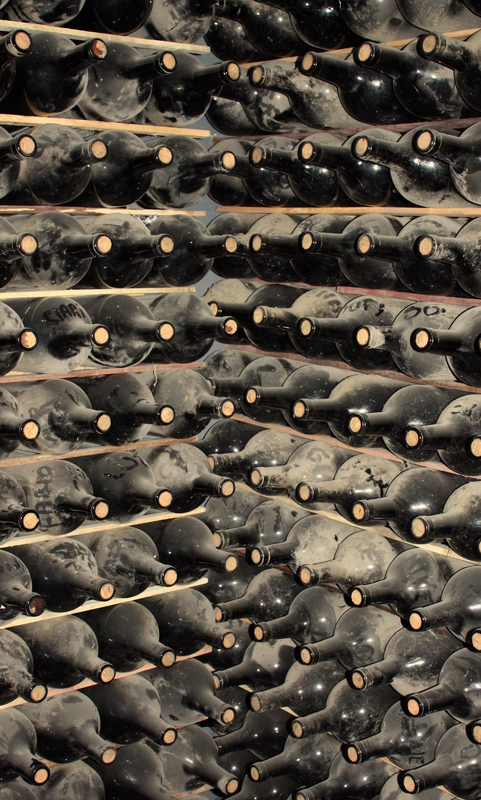 I’m tempted to order una copa de vino – a glass of wine – but I can’t seem to find on the menu any selections by the glass and the price of a full bottle here is less than that of a tasteless Stateside flight. I ask the waiter to pick me out a Malbec and for good measure to tack onto my order two yet-untried flavors of empanadas. He brings me a half-split that’s on par with the best bottle I’ve yet tasted Stateside. I spoon some killer salsa chimichurra over the empanadas, uncaring that it’s probably intended just for steak. A joke spreads from the diners a couple of tables away to their waiter and from him to the next table and their waiter and to the table beyond. This is decidedly looser than even mellow B.A. and I am enjoying the tableau as much as if I was a participant. I’m prepared to die at this moment a very happy man. The empanadas have fallen short of absorbing the Quilmes + Malbec, but I’ve committed to the City Tour at 4 and I’m a man of my word. I exchange names and shake hands with my waiter Mario, tip him generously, and haul myself and my fresh buzz back to the hotel. All of this, incidentally, has cost me little more than US$15… with tip. The City Tour turns out to be much more about listening to the guide lecture than about photo opps, which does not bode well for a gringo with bad Spanish and a camera, but it gives me the lay of the land for forays to follow. It also includes a magnificent view of the city from a mountainside monument and one of the most spectacular metropolitan parks I’ve seen anywhere. Satisfying as my sleep on the bus may have felt, I’m apparently still running a sleep deficit because I’m catapulted into an impromptu nap as soon as I reach my hotel room; I emphatically deny that the Malbec had any part in this. My “short” nap ends when I awaken abruptly nearly 4 hours later at 10:45PM. In the States my dining options would now be limited to IHOP or Denny’s, but I am thankfully in Argentina. I pop out onto the sidewalk where lights are blazing up and down the block and patio dining is raging at full tilt. I’m torn between my newfound loyalty to the Estancia La Florentine and the equally tempting Giovanni’s across the street. I rationalize that my La Florentine waiter Mario is now off-duty and that it’s not really cheating on him if I sample Giovanni’s, where the lighting is not quite as bright nor the tables quite as packed with large parties. It’s late, so I pass over entrees like the quarter chicken – I’m certain that buried somewhere among the entrees is also a quarter steer – and take the easy way out. I graze my way tapas-style through a fistful of empanadas and some pumpkin soup. Once again I do the I-only-want-a-glass-of-wine routine and once again I end up with a tasty Malbec split. The empanadas – the spiced meat criolla is fast becoming a new favorite – are outstanding, but the pumpkin soup is exquisite. As he clears the table my waiter asks how I like it. I tell him more truthfully than he knows Spanish words fail me, and – arm outstretched – pantomime myself mainlining it directly into my veins. He laughs at the crazy gringo, but I think he’s warming up to me. Now the moment of truth has arrived: To dessert or not to dessert. It quickly become obvious that my waiter Diego’s practice of reciting the choices in Spanish isn’t going to fly, and we retreat to the menu where I pick out the flan de casera. It is, however, not that simple: I can have it con crema or con dulce de leche. It’s already a foregone conclusion that before the trip is done I’ll have to return to the jogging trail at that magnificent urban park and do penance for the sins I’ve already committed, so I take the plunge and go for the dulce de leche. I decline an accompanying coffee; these guys are purists who refuse to serve decaf and the gargantuan dollop of dulce de leche containsenough sugar to keep me bouncing off the hotel room walls for the rest of the night. And anyway it’s now past midnight and I leave at (OUCH!) 7AM for the High Mountain tour. I ask reluctantly for the check and find that I’ve yet again failed to break the US$20 barrier, with tip. My hotel is mercifully within eyesight of Giovanni’s, which is a good thing because the dulce de leche has just hooked up with the Malbec somewhere just south of my aorta and my brain isn’t quite certain if I’m coming or going. I stand waiting in front of the elevator for the longest time until I remember that it’s one of those quant antiques which requires you to open a hinged door, pull back an accordion gate, and navigate yourself to your floor of choice. I have to remind myself to close the door and the gate behind me upon entering. On the way up I replay the phone call received from the tour operator earlier in the day recommending that I substitute the High Mountain tour for the Canyon Tour. It turns out, she tells me, that the photogenic clouds I saw on the bus ride here were the remnants of a storm that washed out some roads normally used by the Canyon Tour. Then she blows completely past the TMI (too-much-information) threshold to tell me that as a result of the storm it took two days for them to retrieve the guests from last Thursday’s 1-day Canyon Tour. Then she breaks her own freshly-minted TMI record to share with me that 4 casualties ( as in “mortalities”) resulted from a storm-induced the landslide. I’m thinking that tomorrow morning I may forego my ritual cappuccino and instead get myself down to the local cathedral to light a few candles for them… and perhaps for myself. The B.A. Omnibus Terminal sits downtown very near the railroad’s Retiro Station and is a city unto itself. When I arrive around 6:30PM for my 7:45 departure the crowds in the pre-boarding areas are heavy but orderly. Dozens of shops, snack bars, and restaurants are doing a brisk business, and waiting passengers watch pay-per-view video at chairside kiosks. Outbound schedules for each departure lounge flicker across giant reader-boards, and arrivals and departures for the entire terminal appear on video screens everywhere. The volume is awesome. Just to display all current departures the screens must refresh three times. Upcoming departures are added and old ones retired every three or four minutes and only about 20 minutes pass between each new posting, so this is not a travel choice for the inattentive! Through the lounge windows I see big tourist-sized busses parked side-by-side in angled rows as far as the eye can see in either direction. If the crowd inside is heavy, the crowd in the boarding area outside can only be described as a quiet riot. Out there is not a single unoccupied foot of pavement and processions of people making their way to each departing bus move like currents through the vast human ocean. It is only possible to advance by pressing against those around you, and yet even here is the same Argentine civility I have experienced throughout my visit; voices are rarely raised and there is no shoving. I check my larger bag with the curbside porter, tip him, and board. There are two levels and my assigned seat is on the upper. At the top of the stairs I do a double-take: A broad aisle separates leather seats so wide that there are only three per row. Every other row has been extracted to allow the seats to fully recline and leg rests to rise fully horizontal. Large video monitors are scattered about and music videos are already playing as we await departure. The bus pulls out of the station precisely on schedule, joining a throng of 20 or 30 others also outbound and passing a similar number inbound as it makes its way through downtown traffic toward the autopista. A uniformed steward rises to make announcements, and then to pass the time spent in city traffic he distributes cards for what turns out to be a game of bingo. He calls out the numbers in his best TV game show host tradition and the winning passenger is awarded a bottle of wine. He passes through the cabin to take hot beverage orders for breakfast: coffee, café con leche, hot chocolate, or cappuccino. Once we’re on the autopista he serves dinner, first a cold plate and then a hot entrée and wine with refills. Afterwards he cues up an English language movie with Spanish subtitles and sometime around 11 it’s lights out as we make our way through the very last of the suburbs. Past my window roll the neon signs of motor hotels and Argentina’s ubiquitous parrilladas; I can almost smell the aroma of grilling beef through the glass. Passengers around me have already pulled their curtains and from somewhere ahead I hear a gentle snore. I kick my seat into a prone position, tuck a fat pillow under my head, pull up a blanket, and nod off to the hum of the engine and spinning wheels. I awaken from a satisfying sleep in darkness broken only by the line of streetlights stretching endlessly down the autopista median and small patches of light spaced in farmhouse-and-outbuilding clusters against the silhouette of a dead-level horizon. As we move they are unblinking as they can be only on a treeless plain and I know that we are now crossing the Pampas. From time to time we pass an ornamented gate and arch bearing the name of an estancia or a billboard picturing heavy farm machinery. On rare occasion we pass through a toll booth. Near most exits are villages and many boast a light manufacturing facility; even in the darkness it is clear that there is economic substance here. I doze off. When I awaken the sunrise has already come and gone, but the sun is obscured by magnificently ominous, low-hanging clouds that run from horizon to horizon. They’re not formed in bursts and billows, but in layered shades of gray and white that swoop and swirl like sand-painted snowdrifts. The passengers are beginning to stir and soft American pop-rock drips through the speakers above. The steward serves juice and pastries and hot beverages. Outside the ceiling is lifting and the clouds brightening. The grasslands have burst into sage broken by occasional stands of trees and truck farm patches. The farmhouses have become more modest, the toll booths have vanished, and the highway has narrowed from four lanes to two. Trucks and busses. Trucks and busses. The first, small vineyard appears. An hour or so ahead lies Mendoza, and beyond it the Andes. Yesterday I head for the first time in the opposite direction from downtown to Palermo, the only part of my B.A. Lonely Planet itinerary (find a “link to” at the bottom of today’s post) yet unexplored. It’s not a moment too soon since I depart the city for Argentine parts west this evening. As I’ve been doing for the past couple of days I take the Subte (B.A.’s subway) one way and walk the return. This lets me pack more sightseeing into each day… it’s yet another way to experience more slices of B.A. daily life… and you can arrive by Subte within easy walking distance of every place visited in this blog except the international airport. (There are instructions for riding the Subte at the end of this post). The part of Palermo closer to the invisible coastline is dominated by large parks that include the zoo and botanical gardens and are bordered my multi-use high-rises (think Lincoln Park). I arrive there via the Subte at the Plaza Italia station. Palermo is such a large and varied neighborhood that it’s become widely known by subdivisions tagged with suffixes like Palermo Alta, Palermo Viejo, and neighborhoods now being recast as Palermo Hollywood and Palermo Soho. Find the last pair of these about 10 blocks away from the coast. I avoid Palermo Hollywood, where two new high-rise apartments are under construction. In Palermo Soho the scale shrinks to a two-story neighborhoods undergoing the same kind of renaissance that’s already well under way in the urban U.S. Here 20-somethings rent small, inexpensive flats, patronize hip shops and work out in hardbody gyms, and camp in outdoor cafés talking on cellphones and texting every bit like their Stateside counterparts. 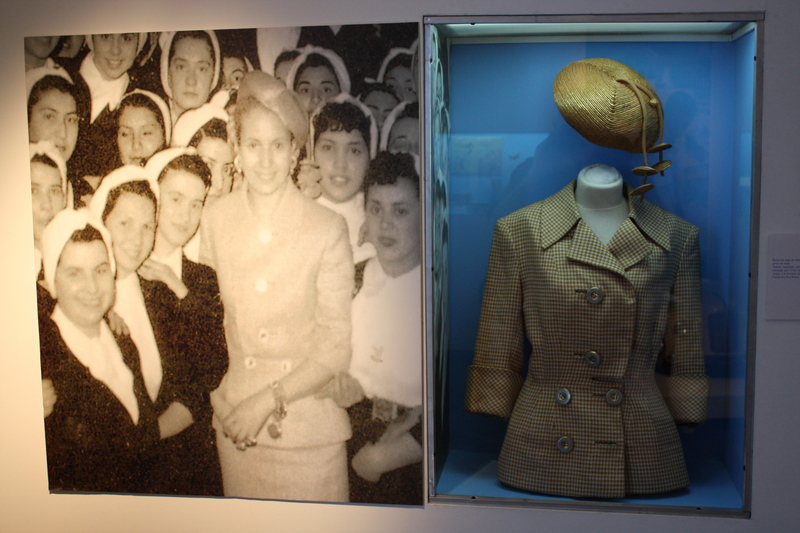 Cheesy as it may sound I opt out of the zoo and botanical garden for the Museo Evita, a short walk from the Plaza Italia Subte station, and it turns out to be a good idea. 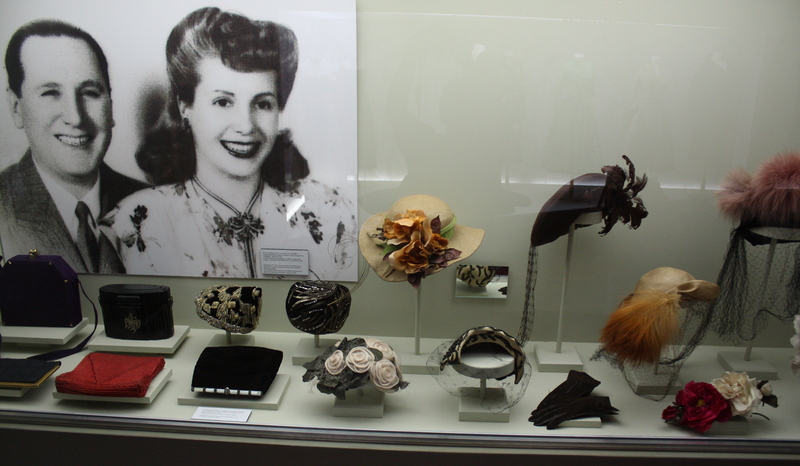 It’s chock full of personal memorabilia ranging from clothing to the Peróns’ black Cadillac, and archival film footage is projected in several different rooms. 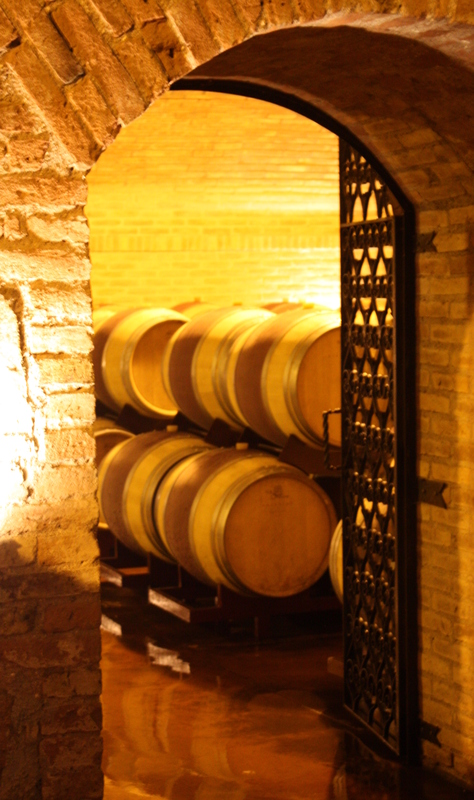 It’s all housed in an old Spanish colonial style mansion that’s worth the tour all by itself. The intent of the curators to take a balanced political perspective is not lost even to my pidgin Spanish! Today is for taking a couple of photos thwarted by Wednesday’s clouds and overcast, to catch up on my writing, and to pack for the bus trip to Mendoza. I regain an Internet connection only around midday tomorrow. Note whether or not your platform is between opposing trains (white line through the station icon) or on either side of the tracks; it’ll keep you from standing on the wrong platform and missing your next train… or going the wrong way (see #2, above). Check your bearings against a map for the first couple blocks after you emerge at your station destination; it’s quite easy to get turned around. Beneath my blog pen name is an Italian surname with the requisite number of double vowels including a pair of “L’s”. In much of Texas where I now live and anywhere else that Spanish is widely spoken it is rare that these “L’s” are not mispronounced as a “Y”… except during my visit to Buenos Aires. The reason, I suspect, is that nowhere else in the New World except the U.S. has been the destination of more Italian immigrants than Argentina. Cappuccino widely appears on B.A. 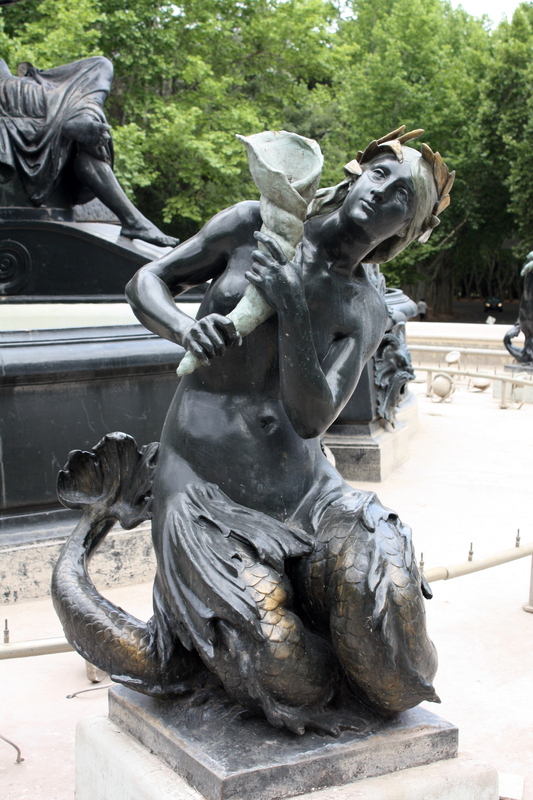 menus as “Italian Cappuccino,” and in the famed La Recoleta cemetery there is an Italian “neighborhood” of consequence not only because of its sheer size, but because of the many ostentatious monuments that speak to the early prominence and prosperity of Italians in Argentina. While Argentina’s Italian connection has its nominal roots in Columbus’s discovery of the New World in 1492 and Amerigo Vespucci’s landfall within the following decade, Italian immigration in any significant numbers did not begin until nearly 350 years after Pedro de Mendoza founded Buenos Aires in 1536. In no other nation do Italian immigrants seem to have had such an immediate and lasting impact. 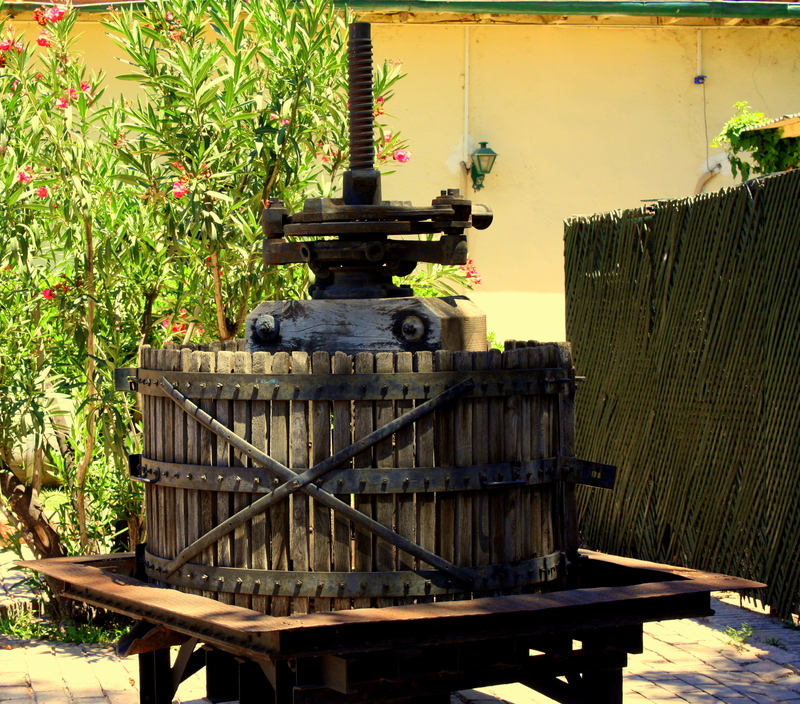 While this is in no small part due to the industry and enterprise that they also amply demonstrated in the U.S., Italians had in Argentina a boost from a unique twist of geo-history. Unlike in Mexico and elsewhere in Hispanic America, Argentina was occupied by no native populations of any size and its pampas geography made ranches a far more important element of rural economy than labor-intensive plantations. The consequence is a distinctive absence of either indigent or African populations as any significant part of Argentina’s ethnography, which accounts in large part for its distinctively European character. 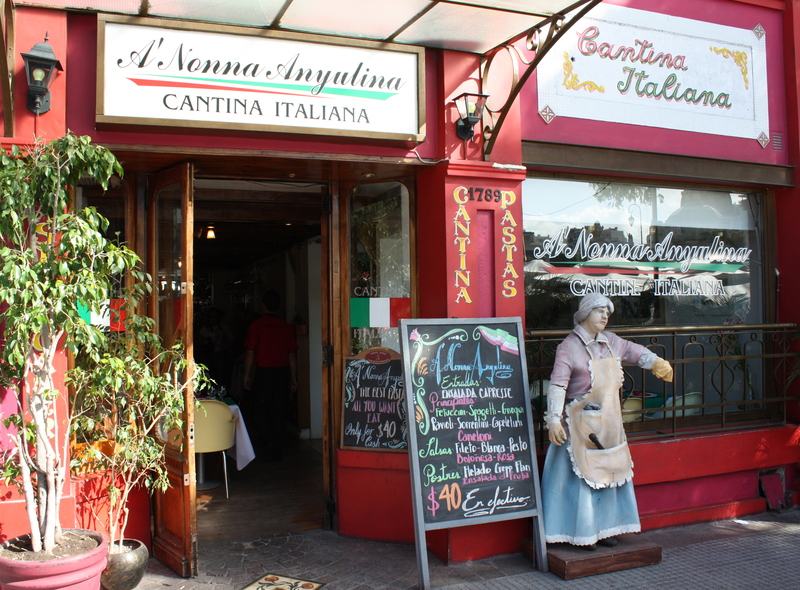 This Euro-centricity set a hospitable stage for the arrival of Italians in Argentina beginning with the massive global Italian immigration of the 1880’s that continued for another 40 years. The prominence of Italians in the Argentine mix also likely contributes to the unique reverence in which Columbus is held here. Elsewhere in Hispanic America where sizeable indigent populations were nearly exterminated by European disease and slave labor, debate now rages about whether Columbus is the first in a long line of Spanish criminals who propagated what we would call today a campaign of ethnic cleansing. As these indigent populations increasingly prevail in the tortoise-and-hare race of assimilation, Argentina may ultimately become one of the few places in Hispanic America that his reputation remains pristine. Italians in Argentina probably haven’t hurt Argentina’s drive to dynasty as a world soccer powerhouse, either; B.A.’s rabid soccer fans bear a striking resemblance to those in Milan and Naples and it turns out that I share my Italian surname with one of the nation’s winningest soccer coaches. In combination with a sizeable immigration of Germans that occurred in roughly the same period and Spain’s World War II neutrality, the high mix of Italians in Argentina also likely contributed to pro-Axis sympathies widely held by Argentinians during World War II. But I digress. As Buenos Aires grew, it spread north and west away from its roots along the river port. In response to epidemics spawned in the low-lying land along the water, its moneyed criolla families left these original B.A. neighborhoods to poor immigrants just as they similarly fled Manhattan’s Lower East Side . The La Boca neighborhood and its El Camionito district were central to the Italian immigrants, where they worked as manual laborers on its port docks and in its meat-packing plants. It was here that tango began as a bawdy, working-class phenomenon that over the years has acquired in its maturity a respectability which has enabled it to become a national trademark known worldwide. Also as they did in America, Italian immigrants moved to the suburbs as they prospered, and that legacy survives today in the naming of the Palermo district that abuts the La Recoleta/Barrio Norte neighborhoods. History, it appears, is not as original as we sometimes think. If you’re like me you may have found the 1982 Falklands War a bit of a head-scratcher. Did the Argentines really think that the Brits were going to let them just simply take possession of the Falkland Islands and forget about it? Did they really think they could hang onto the place if the Brits didn’t? Any why – despite an otherwise long history of friendship, commerce, and cultural exchange between these two nations – did things suddenly turn so nasty over a dispute that existed as little more than diplomatic posturing for nearly 150 years? In an echo of an all-to-familiar theme, 1982 became the year for war because it was the last refuge of an oppressive military regime that had worked Argentina into an economic crisis and needed a popular diversion. It would, however, be a mistake to assume that the war was afterward swept under the rug along with the deposed generals when democracy returned to Argentina. For the record, Britain’s 1833 occupation of the islands had its roots in a fishing rights dispute, and – not unlike America’s War of 1812 – came at a time when a fragile new Argentine republic was especially vulnerable to the Empire’s military might. As I walked on Sunday around the Casa Rosada, Argentina’s White House, I noted among the many banners hanging on the surrounding fence one in support of the veterans of the Guerra de Malvinas. I’ve since seen posters referring to associations of – and assistance to – Malvinas veterans, but I saw today the most graphic example of the national sentiment which lent itself so easily to the generals’ manipulation. Remember that Argentina is a place where polo rivals soccer as a national sport… where a B.A. outpost of London’s famed Harrod’s department store was a longtime icon… and where English names crop up so frequently among Spanish in the pantheon of local notables that you’d think you were in Gibraltar instead of Latin America. 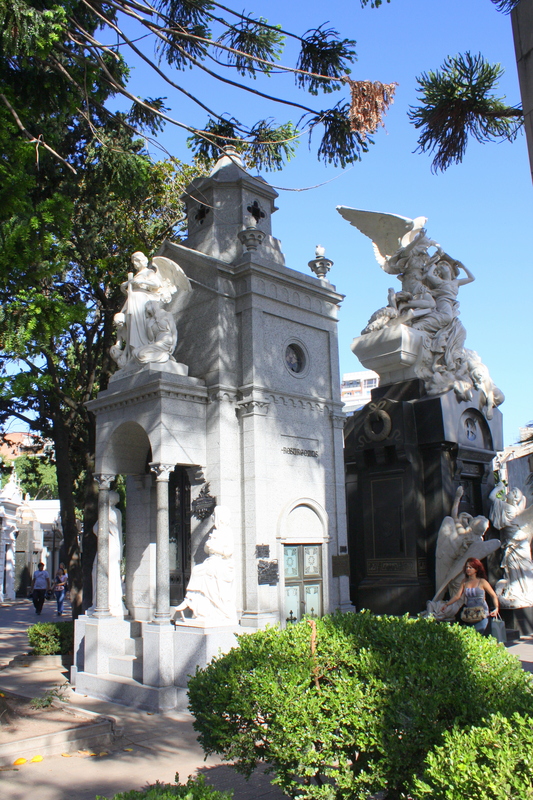 Beginning in the 1880’s and continuing well into the 20th century, the British contributed by far the lion’s share of the foreign investment capital that fueled Argentina’s economic growth. Running through the heart of B.A.’s chi-chi Retiro District – separating neighborhoods that feel amazingly on one side like Manhattan’s East Side Midtown and on the other like its Upper East Side is a beautiful urban park that’s technically four grassy plazas laid end-to-end. Here the Malvinas dispute is played out as if on some life-sized Monopoly board. From the center of the Plaza Fuerza Aérea Argentina rises a 250-foot clock tower that looks like it belongs in colonial Williamsburg. It was a gift of the city’s British residents to their adopted city that has stood since 1916 and was until 1982 known as the “Torre de los Ingleses.” During the Falklands – er Malvinas – War the authorities actually thwarted plots to topple it with explosives and it has ever since been the popular target of desultory graffiti. 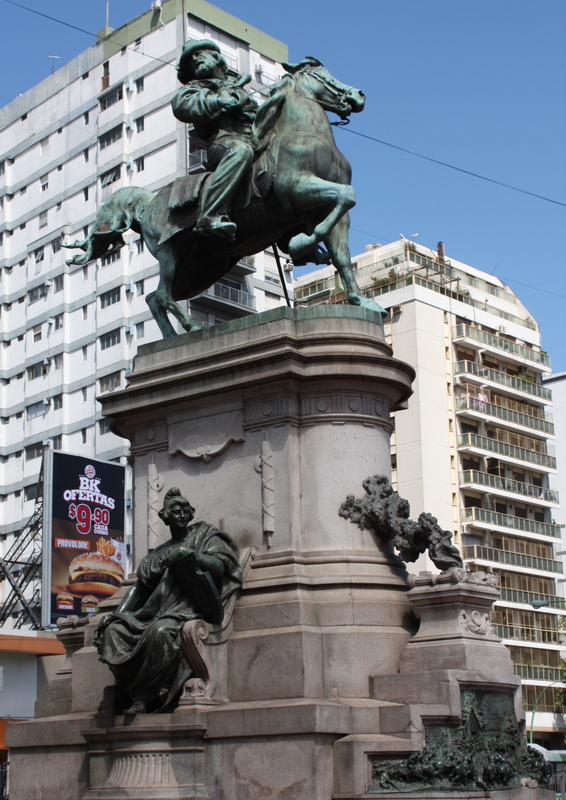 Just opposite it on the Plaza San Martin stands the Monumento a los Caidos de Malvinas. A monument to those fallen in the Malvinas War, it was dedicated only 8 years after the conflict in 1990 by a popularly elected, post-junta government. Here an eternal flame is raised above a wall constructed in the fashion of the U.S. Vietnam Memorial and upon which are mounted side-by-side plaques bearing the names of more than 600 casualties. The wall itself is painted a color that can only be described as blood red. As I stand between these two monuments, I cannot help but recall standing in the shadow of the Eiffel Tower on the Champs de Mars opposite the Ecole Militaire de Saint-Cyr, France’s equivalent of West Point, where sits just as paradoxically the Peace Monument erected in 2000. America claims to have bars and eateries where “everybody knows your name,” but they are increasingly franchised chain clones with faux historical decor, uninspired menus, and rotating casts of alternately self-absorbed or mechanically detached managers and waitstaff. America, in fact, has already passed the tipping point beyond which there are more chain restaurants than “mom and pops”. Everywhere else in the western world foodservice means locally owned cafés and bistros which often serve three meals daily, where food is freshly prepared and reasonably priced, where the staff and ownership have remained unchanged for years, and that have truly acquired the status of neighborhood institutions. 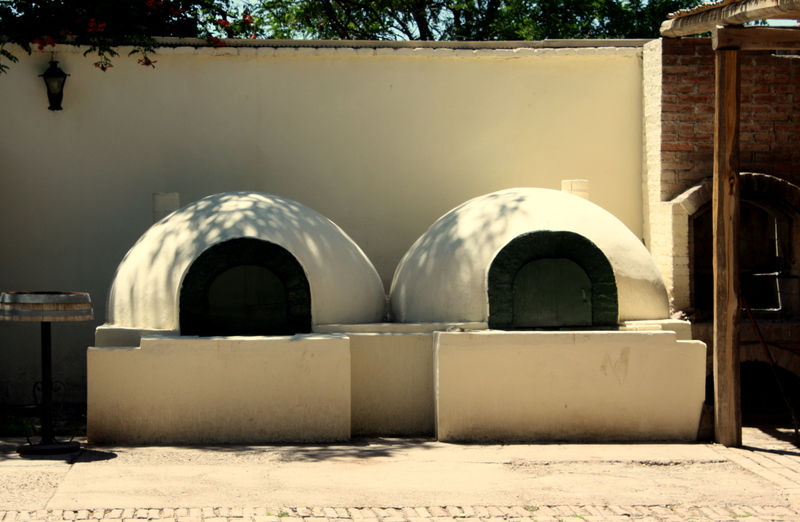 In Buenos Aires these are called “confiteria,” and you’ll find one at or near virtually every street corner. As my B.A. immersion deepens, I find myself more often starting the day there with an espresso or cappuccino, grabbing a light midday snack, or occasionally taking an evening meal. 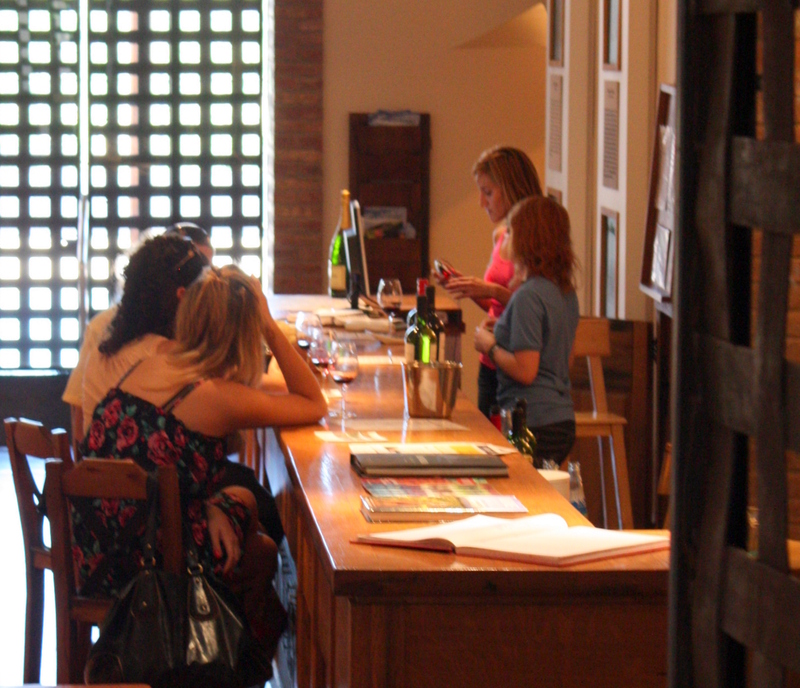 It’s another great way to experience a daily slice of Argentine life and to observe and better understand the B.A. psyche. These places seem to cut across social classes in a way that establishments in nominally classless American society increasingly do not. During morning rush hour a suited businessman can often be found seated at a table next to a store clerk wearing her workplace smock. This leads me to reflect further upon how common it is in B.A. to see people wearing workplace uniforms to and from work in a way that Americans haven’t since the 1940’s. For one thing, trade unions remain a powerful force in Argentina as in other social democracies, and the right to a lifelong job is still widely and successfully sought after as a political right. In contrast, American workers seem increasingly to see their jobs as a transient part of their lives, and at best peripheral to their identities. But there may be even more to it than workplace identity. I am struck as I walk among literally thousands of pedestrians every day by the singular absence of affinity-branded clothing among porteños. Rarely if ever to be seen are shirts with pro sports or college alma mater logos, political slogans, political incorrectness masquerading as humor, or variations on the “I’m-a-bad-boy-and-that’s-a-good thing” theme. It’s as if Argentines have an inner compass that lets them feel secure in their personal identities without the need to label themselves and broadcast it on their chests. While the chic shops carry the latest from European designers, porteños’ choice of clothing most often has an understated sense of style that seems to place a higher value on timeless fashion than on here-today-gone-tomorrow trendiness. This sense of self and balance seems also connected to a different sense of time. I am struck as I move around the city by the singular absence of clocks on public buildings and in shops and restaurants. This place hustles and bustles from 9 to 5 in a way totally unlike the sleepy, banana republic version of Latin America, but it is not a nation of clock-watchers. What a contrast this is with the Japanese, who often seem determined to out-do Americans in their embrace of rock ‘n’ roll music, golf, Western fashion, and the longest white-collar work week in the world. The New World seems so often to have freed transplanted European culture of its most onerous confinements to make it more open and easy-going. One can’t help wonder, however, at the different turn that metamorphosis has taken 40 degrees north of the equator than it has here, 40 degrees south of it.